The prospect of having a new or redesigned website can be exhilarating. You daydream about the visuals, how well it will function and attract clients, and the new people it will reach. But, how do you get from point A to point B when you're ready for that site now? I see so many small businesses try to dive into website design before they are truly ready. For most people, your website is your most powerful tool in getting people to hire you or purchase your product. Why would you want to rush something so big? Whether you are just starting out and going the DIY route, or looking to expand and hire a pro, the same process can shape your approach. 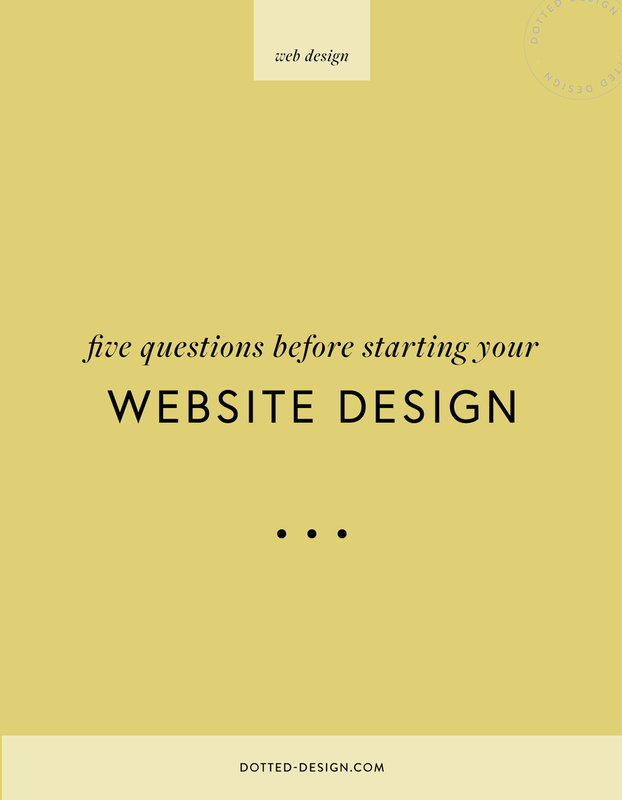 Ask these 5 questions before you embark on a web design project! What is the single main purpose of my site? Sure, you want people to sign up for your newsletter, follow your social accounts, comment on your blog, etc. But, if a visitor could only take one action, what would you want that to be? View your services and hire you? See your new arrivals and purchase that product? Whatever it may be, make sure that action is front and center. This purpose should be on your mind as you develop each page and consider the site's navigation. Make it possible from every page and not something a potential customer has to search and search for. .
What is my brand's personality? Before you build the site, you need to understand your brand's values and point of view. This includes designing your brand's visual identity, which is items like your logo, brand colors & fonts, and style. Your brand identity is your base, and the site is built up from this style foundation.If you are redesigning your site, you might instead ask, what about the personality of my current site isn't working or do I want to change? Having a grasp on these concepts will also make it easier for you to find a web designer that matches the style and aesthetic you want to achieve in your website. (See this post for more on defining your brand!). What content do I need to prepare? This one is a biggie. Before the web design can begin, you first need to consider what pages you require and how they will connect. Then, you must have all your copy written or updated, photos taken, videos recorded, and any other content that will be part of your site.Many people get eager and want to work on the design and layout before these pieces are all ready, which requires patience. I know you're excited, but designing a site without having the copy ready is like trying to bake cookies without the flour. Sure, you can mix up the rest of the ingredients in preparation, but nothing will come together into batter form until the flour is added. Plus, seeing the copy and photography will help the designer get a better sense of your overall brand style and then reflect that in the design. .
What outside accounts will I need? Beyond the site itself, you'll need to consider what outside accounts you want to set up, like your mail server (MailChimp, Infusionsoft, etc. ), social media, etc. People will most likely find these on your website somewhere, so you'll want to be able to consider how to incorporate opt-in boxes or links to these important accounts. They are usually a way for someone to stay connected to you after they leave your website - oh so important! . What are some examples of websites that inspire me? When you are ready to work on your website, start paying closer attention to the websites you visit. What makes you want to stay on a site? What makes it easy to navigate? What makes you yell ackkk!! and close the tab? You'll start to see patterns in the styles and layouts that you love, which will help in determining the direction of your own site. Using several inspiration examples will help you stay away from straight up copying another site and instead use the bring the best elements together that will be uniquely yours.Make sure you are also staying away from anything that feels extremely trendy. While there may be a new standard in functionality that you want to be sure to incorporate, make sure you are singing your own song when it comes to your visuals. If you start to see everyone's homepage display a marble background with pink flowers on top, perhaps you should try a photo that won't blend into that crowd quite so easily. A great test is if your photo is pinned onto a Pinterest board, would anything distinguish it from all the other visual noise? Though this process requires more thought and planning, it will help you immensely down the road in the web design stage. Staying thoughtful and purposeful will help your business grow in the long run, and who wouldn't want that?